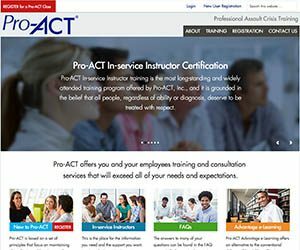 Pro-ACT is one of the leading providers of Professional Assault Crisis Training in the country – offering ‘Train-the-Trainer’ courses and certification. When they needed to move beyond the ‘spreadsheet database’ and provide a ‘proper’ data and document repository for their internal and clients’ access, they turned to DCP Partners to design, build, and host their database and site. We worked with the Pro-ACT team to define the features they were looking for, then designed and built a custom database and WordPress plugin (along with a new site) that provides all of the features they need to manage their customers’ information … as well as providing customers with access to self-administration features for their data.